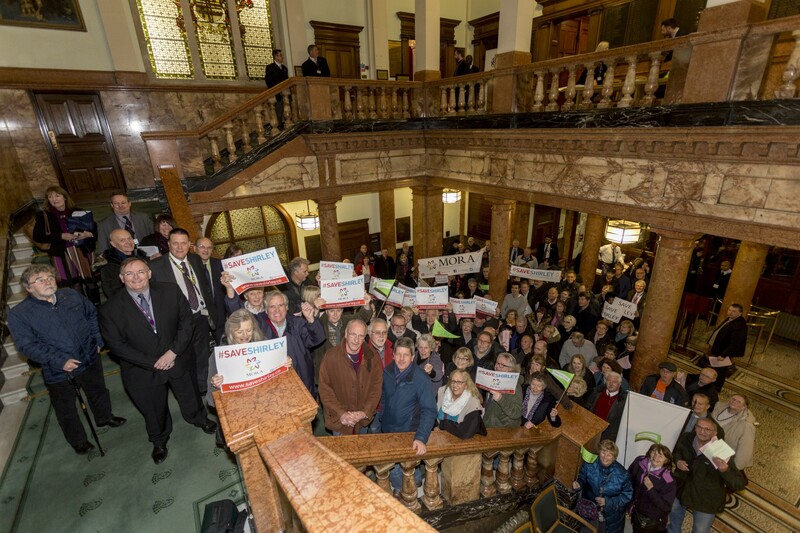 Croydon Town Hall was overwhelmed on Monday night with more than 450 Shirley residents to hear the Save Shirley petition of more than 3,600 signatures presented to the council and the debate that followed. So, thank you to all of you who queued down Katherine Street. The meeting was delayed by 20 minutes as council officials struggled to set up screens and speakers so everyone who had arrived for the meeting could watch the webcast and lively public debate. And it went downhill from there, with the meeting being suspended by 15 minutes as Croydon CEO, Nathan Elvery and the Mayor left the meeting amidst utter chaos. There blatant bias culminated in the refusal to allow a vote. It’s obvious that there is no such thing as democracy in Croydon Council. Save Shirley and MORA have called for a public meeting with Cllr Newman on the proposals, but he said he will not agree to this until the outcome of the public consultation on the proposals has been published. We are not prepared to wait that long. So we’re starting to build momentum and have a few more things up our sleeves, but we still have a long way to go. So we’d appreciate if you’d email him at tony.newman@croydon.gov.uk urging him to accept our invitation and keep the pressure on. Then on Tuesday morning Save Shirley was invited for a TV interview on the London Live Breakfast Show, our local MP, Gavin Barwell, attended this. If you would like to read the speech Dave Greenwood presented you can download a PDF copy here.